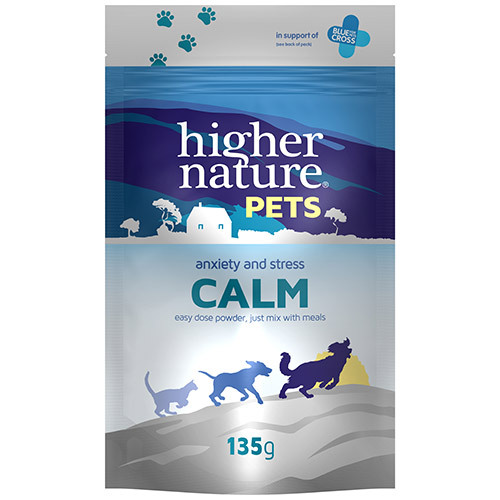 The Higher Nature Pets Calm is a blend of magnesium, theanine and tryptophan to support stress and anxiety in cats and dogs. Ideal for when your pet feels nervous, such as bonfire night, thunder storms and car journeys. Also supports pets who are particularly nervous or anxious. An easy dose powder, just mix with meals. Rice flour, magnesium citrate, L-tryptophan, L-theanine. Take twice a day, sprinkle over or mix into food. For fussy eaters can be mixed with your pet`s favourite treat. Take when needed. Can also be taken on a long term basis. Cats & very small dogs up to 5kg: ½ tsp twice a day. 90 servings. Small dogs 6-15kg: ½ tsp twice a day. 90 servings. Medium dogs 16-30kg: 1 tsp twice a day. 45 servings. Large dogs 31-45kg: 1½ tsp twice a day. 30 servings. Very large dogs over 45kg: 2 tsp twice a day. 22 servings. Not advisable during pregnancy and lactation or if taking sedative or anti-depressant medication. 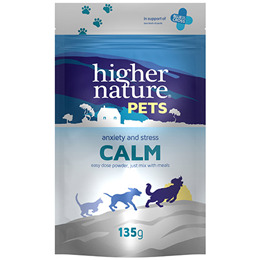 Below are reviews of Higher Nature Pets Calm - Anxiety & Stress - 135g by bodykind customers. If you have tried this product we'd love to hear what you think so please leave a review.